When I think of winter whites, I think of those elegant ensembles: cashmere and wool, floor-length coats. The kind of outfits that no woman with children under 10 would ever dream of wearing. I’ve never thought I could pull it off. I’ve never even tried it on fearing a greater resemblance to Frosty than the women in the catalogs. In lieu of wearing winter whites, I pour them. In winter, I may choose a bit more oak. I may choose wines with a little more body. But I don’t want to sacrifice the acid required to keep the wine balanced. Three samples I’ve tried recently fit the bill. 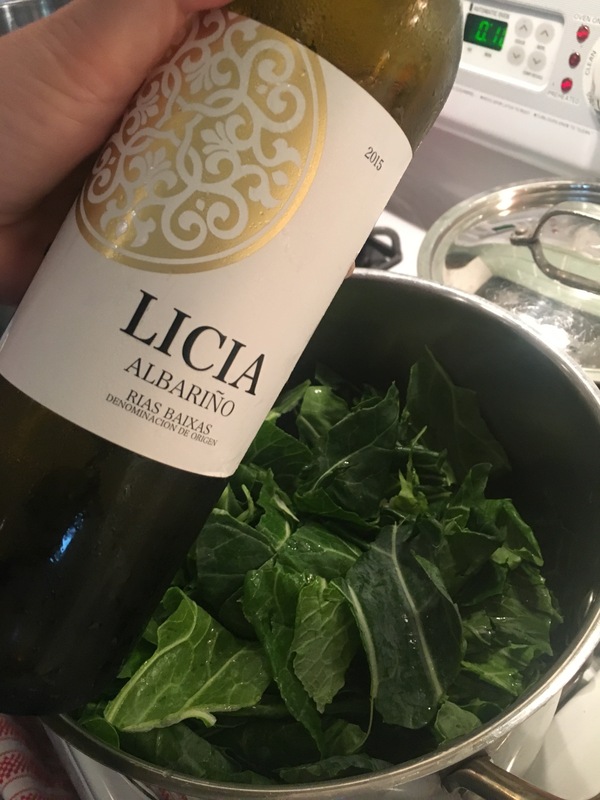 If you need a little more sunshine in your life this winter, literally or figuratively, look at Albariño from Rías Baixas. The region, with its cooler climate and surplus of mineral in the soil, yields some of the finest Albariño you can find. With notes of stone fruit, yellow flowers, and vibrant acidity, these wines are sunshine in a glass. I recently sampled two from the region. The first, paired with our New Year’s Day meal of ham, black-eyed peas, and collard greens. I wanted to counter the saltiness of the ham, something with enough minerality to hold up to the greens. The 2015 Licia was just what I wanted. In Texas, the winter temperatures can vary 50 degrees in one week. You need some wines on hand that can handle the swing. The 2015 Bodega Castro Martin could easily warm or refresh. I paired it with a dear friend great conversation. While baking five cakes for a school event, we sipped on a glass (or two). This wine leaned more toward crisp apple and lemon zest than stone fruit. The floral minerality added to the interest and made this a wine that could just as easily be enjoyed with a variety of dishes as alone. Choose roast chicken, grilled fish, crumbly cheeses, a comforting veggie dish, or cool salads. Another white I opened over the holidays was a Bordeaux blend by the Scotto Family. The name is an acronym of the Scotto children’s names. Napa by N.A.P.A Bianca’s White is a blend of Sauvignon Blanc and Semillon. When evaluating the sample I could not get past one idea: Pink Lady Apples. Since I eat one daily, I was more than pleased. Like the apple, the wine was a balance of tart and round, soft and crisp, apple (obviously) and perfumed citrus. It is one I will be seeking out again. If you can pull off the winter whites, more power to you. If you aren’t surrounded by little dirt magnets or have a great dry cleaner, wonderful. But if, like me, you prefer black pants and messy hugs, you don’t have to forego all winter whites. Just the cashmere ones. Cheers! Great content. Well written and I agree with the thought of selecting white wines with more body in winter. I love the crisp refreshingness of white in winter; both wine and clothes.